Hope you all had a great weekend. The weather is bringing us piles and piles of snow today so we're snuggled in for the day, recovering from the weekend. Weekends are hard on my home. With everyone home, the rooms seem to explode with clutter! I typically spend the majority of Monday, decluttering and getting back into the weekday groove. Please tell me I’m not the only one struggling with this! Anyway, on to what a really want to talk about today. This morning while I rushed around my house, arms filled to overflowing, inspiration struck - - TWICE! Thought maybe you might enjoy taking a look. Inspiration #1: Bathroom Towel Holder. 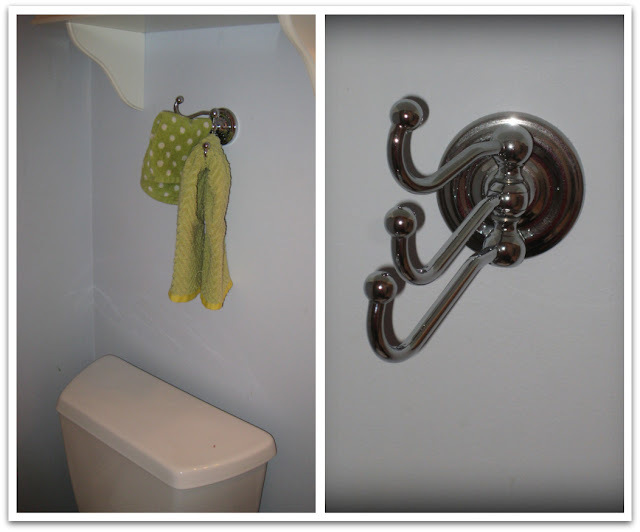 This is the towel holder I installed a couple years ago in our itty-bitty master bathroom. Inspiration struck for the second time as I scurried into my junk laundry room. Carefully balancing an armload, I started to panic as I glanced around, looking for a place to unload. Not a clear spot to be found. Bummer – now what am I going to do! I made a quick decision to just add to the pile and promised myself “tomorrow I’m cleaning up this room, I promise”. Seriously, it’s so bad if I showed you pictures you’d never come back to visit me - - it’s that bad! So I added to the pile, spun around and headed for the door. Almost made it out of the room before I heard a mini avalanche behind me. The two rolls of wrapping paper I had placed on the top of the pile were now on the floor, unwrapping itself as it rolled across the floor. Grrrrrrr! Grumbling, I picked them up and started searching for a better place to stash them. Here's where they ended up . . .
Huh! It works beautifully, it’s like I planned it all along! You just gave me a wonderful idea for storing my gift wrap, Robin! Thanks!